Hello, all. Long time no see. I’m back to TLS having joined a neat little website called TuitionBites. TB lets me open up a little shop where I get to sell a monthly item – each sale helps me pay off my mountain of student debt! 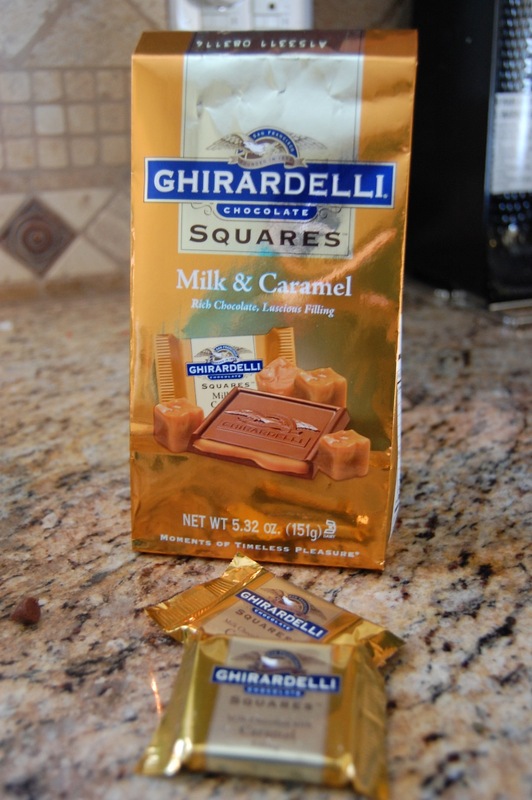 This month’s item includes Milk & Caramel Ghirardelli Squares. 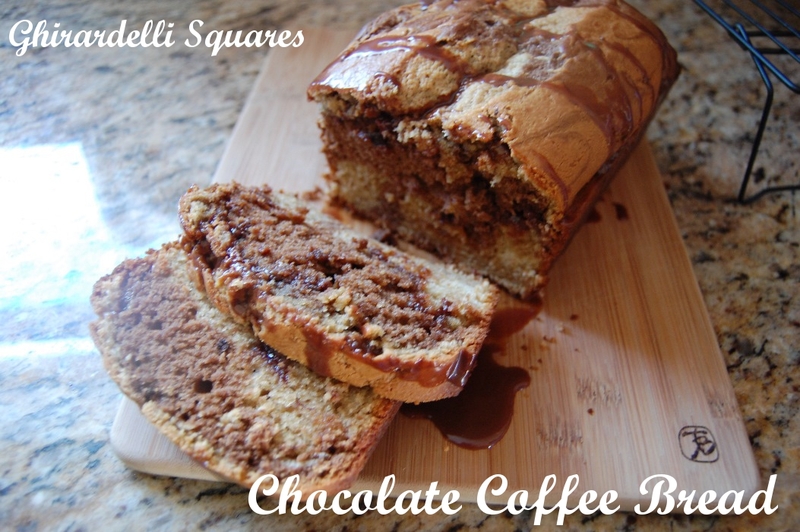 So I stuck them in a delicious bread to give you: Ghirardelli Squares Chocolate Caramel Coffee Bread. I’ve told you time and time again that I am not a baker, but even I found this recipe pleasantly easy to put together. The Baker walked me through the steps and at the end I was left standing, palms up, asking, “that’s it?” Yes, that’s it. The Baker explained to me that scraping the pan is the #1 Rule of baking. What do you guys think of her work? Expert level? 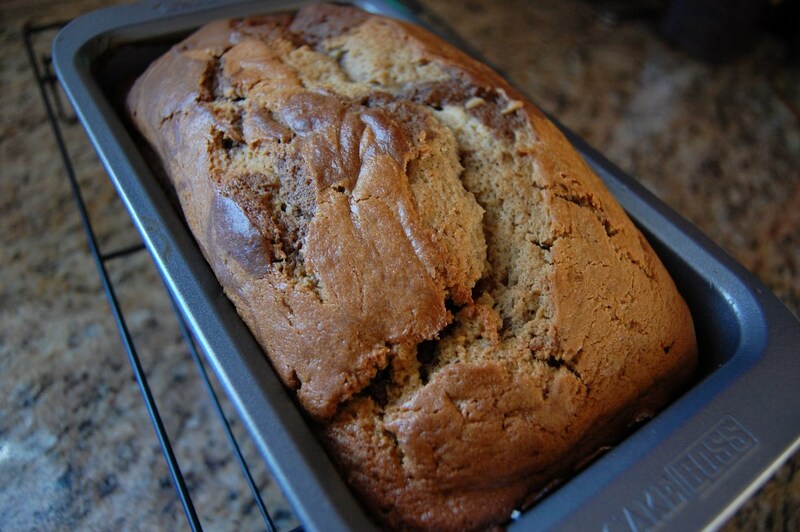 Raise your hand if you’ve made cakes or breads with sour cream! I can’t believe how ultra moist this recipe turns out to be. Sour cream is my new favorite baking ingredient. I can’t wait to try more recipes – if you’ve got one you love, share it in the comments! Seriously, look at how velvety and smooth that looks. 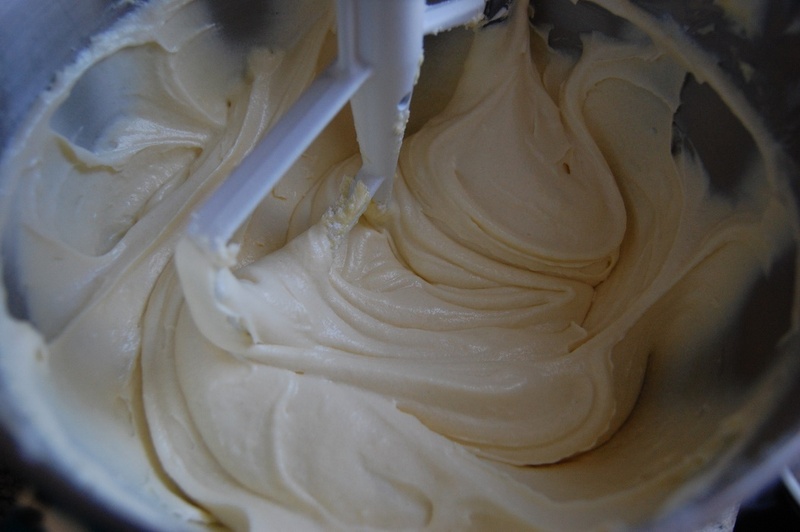 The dough actually ends up looking a lot more like cake batter (though it will stiffen a little after you add the last bit of dry ingredients). It bakes up into a very cake-like loaf, but if we call it bread we can eat it for breakfast, right? The Baker says so. 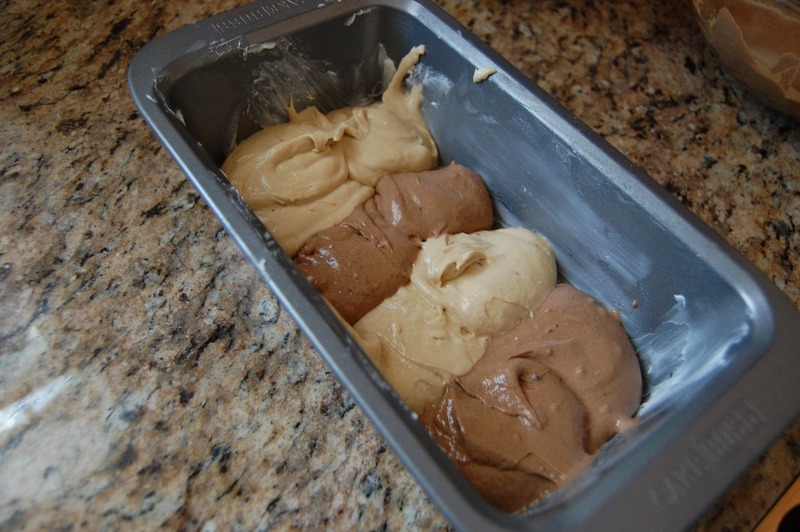 The dough gets divided between two bowls, with cocoa powder added to one and instant coffee to the other. You can use any kind of instant coffee in this recipe and, actually, you can add plenty more than the recipe calls for. In fact, I think that when I make this again, I will probably double the amount of coffee. Twirl and swirl until it’s nice and mixed. You should end up with one dark bowl and one light bowl. This is important because you will layer and swirl the dough (batter…) in the loaf pans to get a pretty marble in the final product. Here we go. Start with a layer of batter and switch off between a generous spoonful of cocoa batter and a generous spoonful of coffee batter. 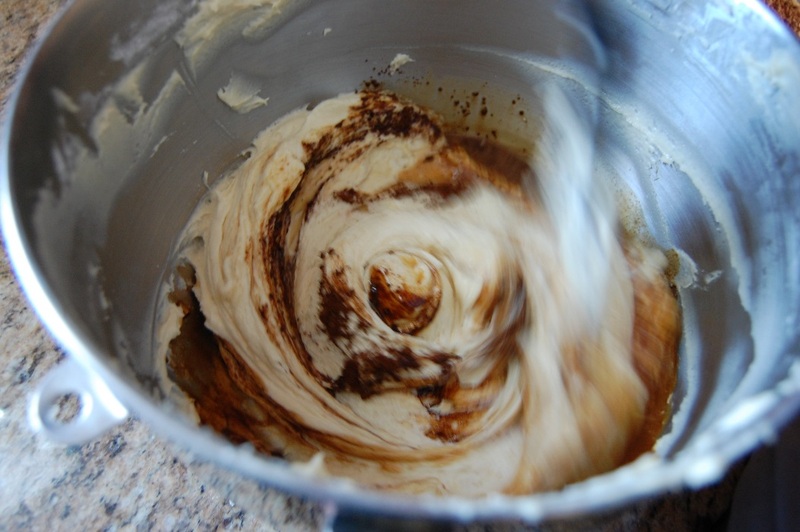 Swirl the batter – get as artsy as you like. Maybe you want someone to cut into your bread and it evokes the energy of rolling waves. Reach for the stars. You can’t screw it up here. Finally, our star makes its first appearance. 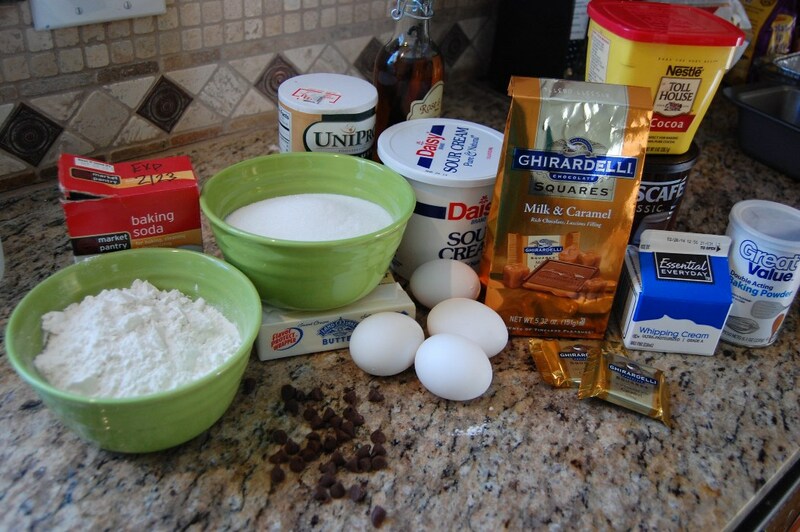 Put three Ghirardelli Squares in a diagonal line on top of the first layer of batter. Or a straight line, whatever you want. Now do another layer of batter. 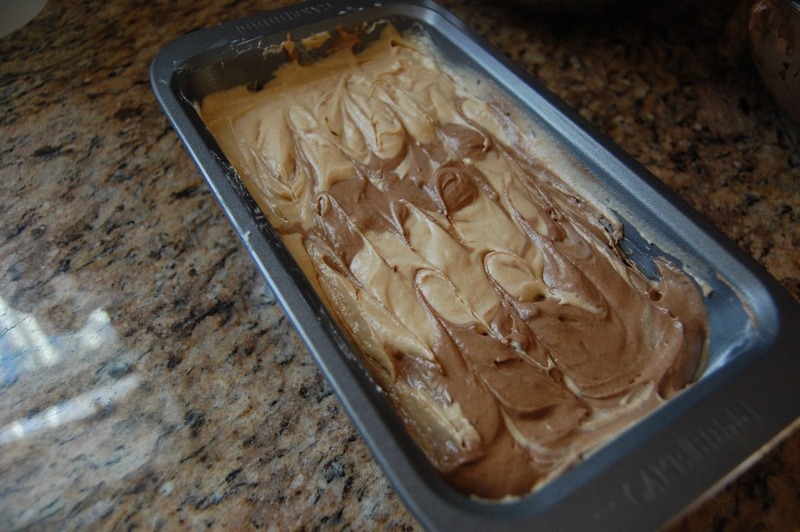 If you started with cocoa batter at one end of the pan, start with coffee batter at that same end this time. 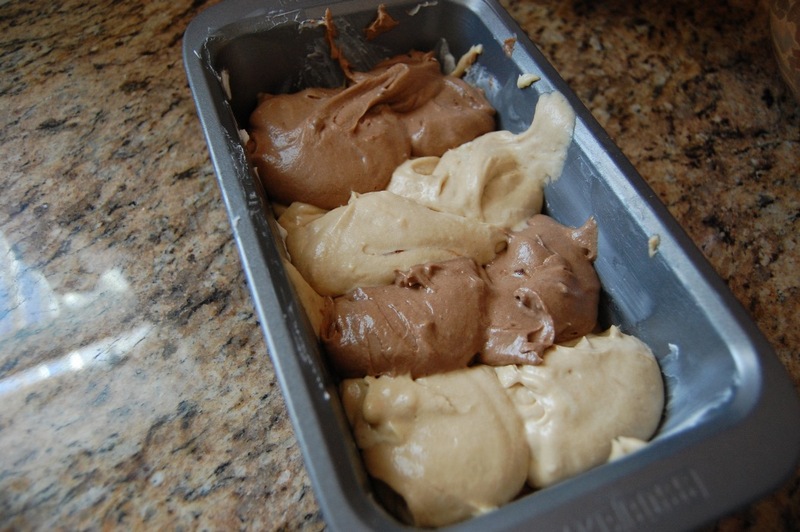 When you swirl this time, be careful not to press deep enough to move the Ghirardelli Squares. Add three more Ghirardelli Squares – we went with another diagonal line, but in the opposite direction of the first one. Spoon on a final layer of batter (again taking care to put cocoa batter on top of the coffee and vice versa). While it spends 10 minutes cooling in the pan, whip up the glaze using the last of the Ghirardelli Squares. Drizzle the Ghirardelli Squares glaze over the partially cooled loaf. 1. Preheat oven to 350 degrees F. Grease 2 (9 x 5 in) loaf pans and set aside (note: if you don’t have two of these pans, you can buy the single use ones at most grocery stores). 2. Combine flour, baking powder, baking soda, and salt in small bowl. 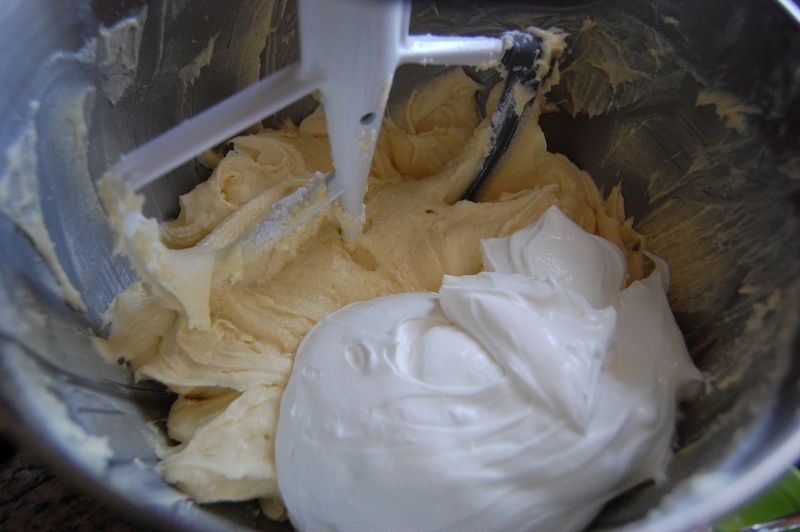 Beat butter in large bowl with electric mixer until creamy. Add sugar; beat 2 minutes. Beat in eggs and vanilla. Beat in half of flour mixture until well blended. Add sour cream; beat about 1 minute or until well blended. Beat in remaining flour mixture. 3. 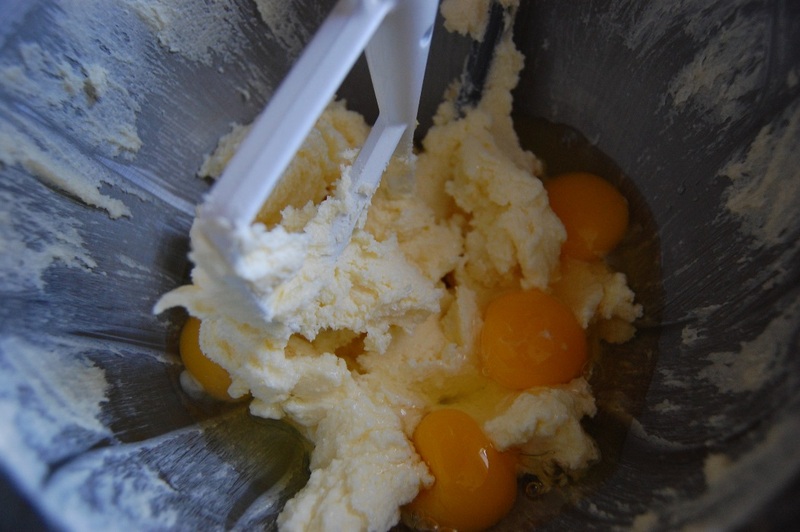 Remove half of batter to medium bowl. Add 1 tbsp coffee powder and 2 tbsp hot water to the bowl; mix well. 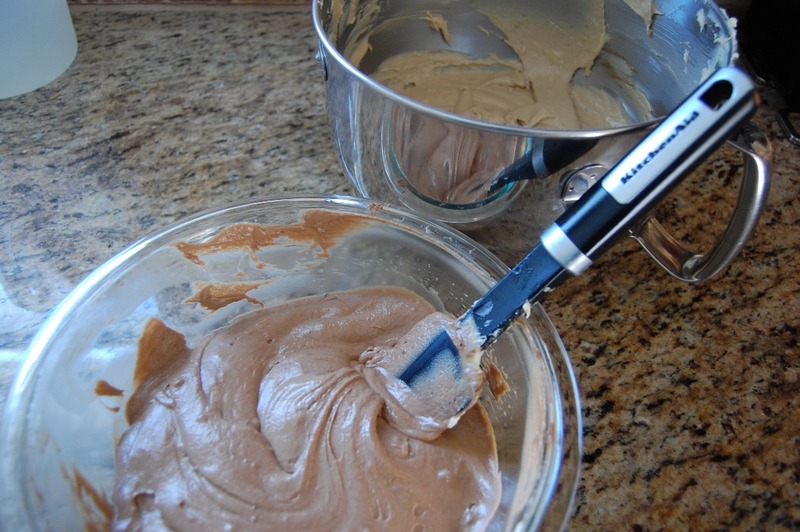 To remaining bowl of batter, add cocoa and remaining 3 tbsp water; stir until well blended. 4. Drop large spoonfuls of batter from each bowl alternately into prepared loaf pans to create 1 layer of batter; swirl to create marble effect. After 1st layer, add 3 Ghirardelli Squares chocolates. 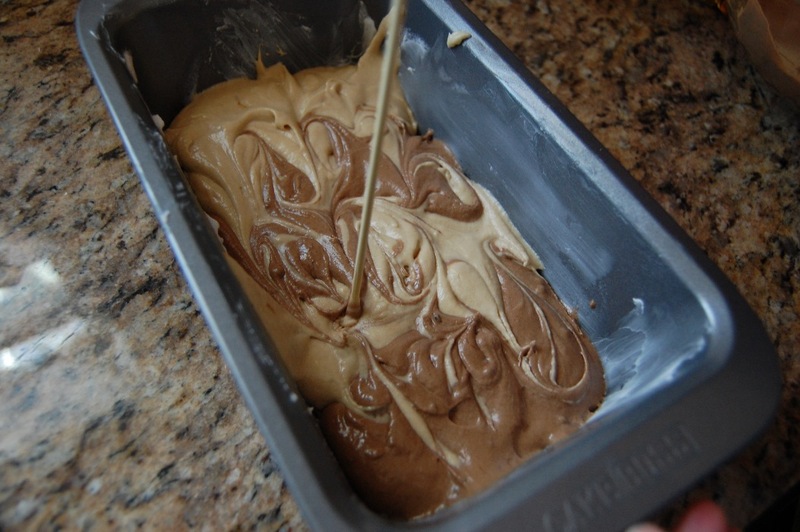 Add a 2nd layer of batter, alternating between cocoa and coffee, and swirl. 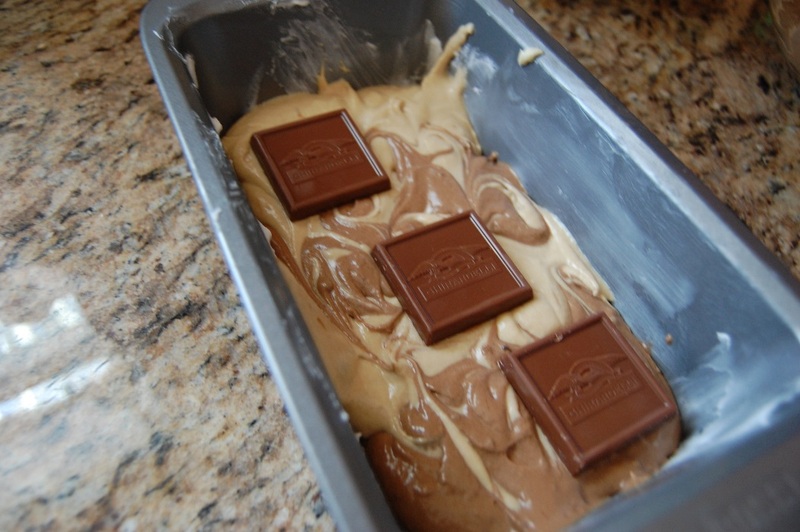 Place 3 more Ghirardelli Squares chocolates and add 3rd layer of batter; swirl. 5. Bake approximately 1 hour or until toothpick inserted in center of loaf comes out clean. Cool in pans on wire racks 10 minutes. Remove from pans. 6. 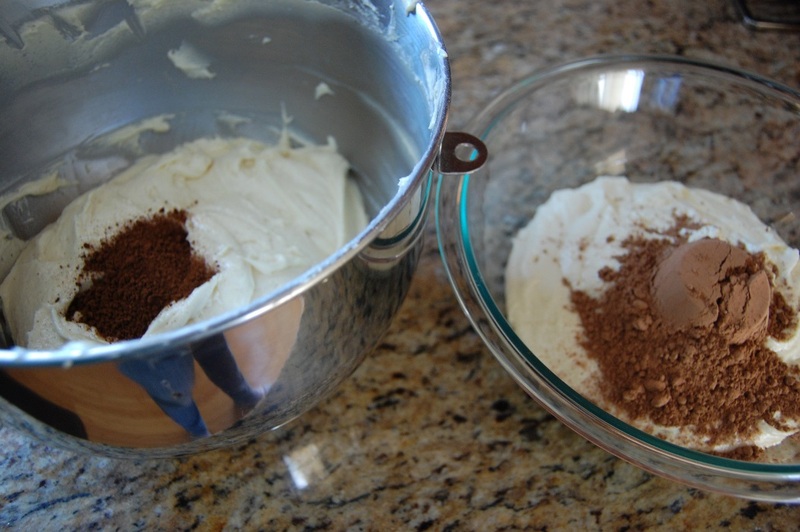 Combines remaining Ghirardelli Squares chocolates (8 pieces) with 1/4 cup whipping cream in microwave safe bowl. 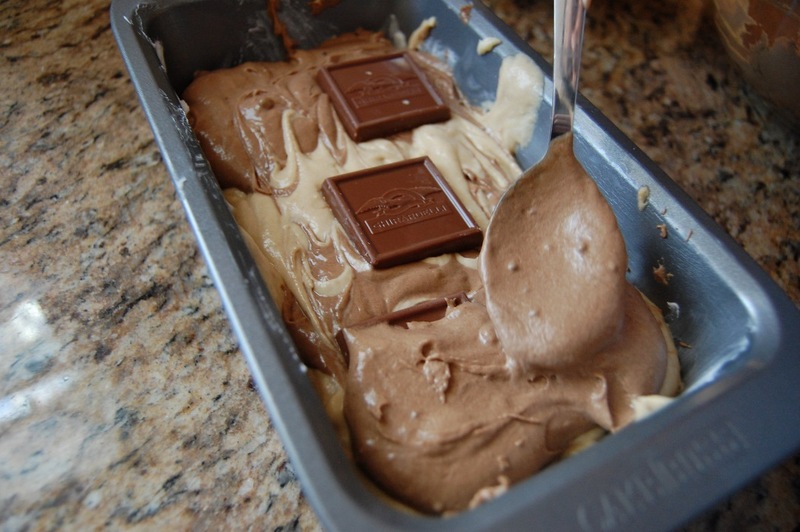 Microwave on high in 10 or 15 second intervals, stirring after each interval, until chocolate is melted and glaze is smooth. Drizzle glaze over loaves. Best served warm. 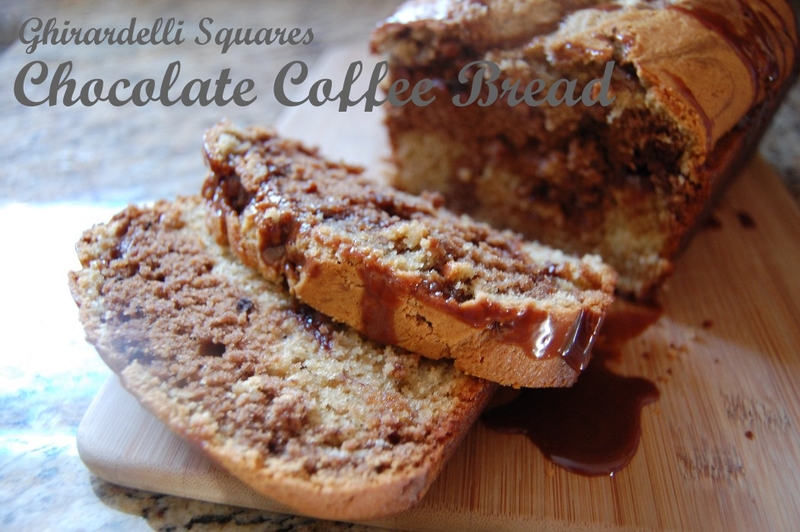 This entry was posted in Baking, Breakfast, Desserts and tagged Baking, Bread, Cake, Caramel, Chocolate, Coffee, Cooking, Dessert, Easy, Ghirardelli Squares, Loaf, Loaves, Marble, Recipe, Simple, Sweets by Lazy Suzan. Bookmark the permalink. We had lots of those Ghirardelli squares around Christmas and, in fact, I just ate the last one yesterday. But I’ll be getting some more because I have to make this bread. It looks so delicious in so many ways. Let me know how it turns out! 🙂 Thanks for stopping by. This bread is so pretty! Those Ghirardelli squares are my favorite. Thanks! I hope you’ll try making it sometime! I LOVE those caramel filled squares! (even though they tend to make my fingers a sticky mess) Your bread looks great! I’ll have to try it! Beautiful bread , done marvelously. Nothing lazy about this. Well done and thanks for stopping by my blog. All the best…..
That bread looks delicious. I also enjoy using sour cream in my baking. Lately, I have been on a buttermilk kick. I just love chocolate buttermilk cake. It looks fantastic. 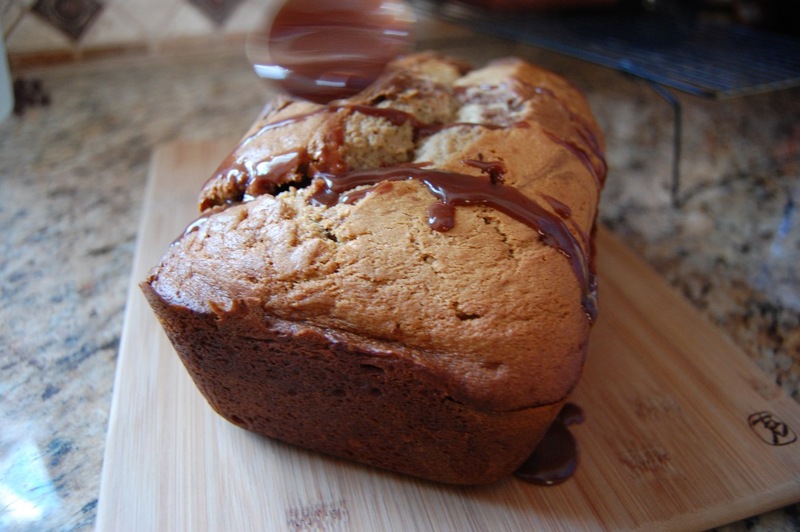 I’ve never made any type of cake bread with more than one flavour but this does look really easy. Oh my gosh…. I have to have this. Looks so so good! This looks sinfully delicious. You have a neat blog. Wow, this looks amazing! My mouth is watering… I think I might try this as a treat to myself! This looks like the most delicious thing ever created. I bet I could live on this. Your photography is beautiful, and the bread sounds delicious. Ummmm – – – I am on this recipe ASAP! YUM!!!! Love your site! Complete genius! Oh my gosh, the chocolate glory. 🙂 I like the pretty swirling on the cake. Ooh, good excuse to buy some ghiradelli squares!